In response to the positive and encouraging feedback to the first episode of Radio Sai Study Circle, H2H features this second episode that will dwell on another tiny drop from the infinite ocean of Bhagawan’s message and teachings. 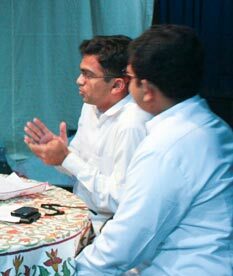 As in the previous episode, the discussion will draw the participation of four former students of Bhagawan’s University. While Amey Deshpandey (AD), Sai Giridhar (SG) and K.M. 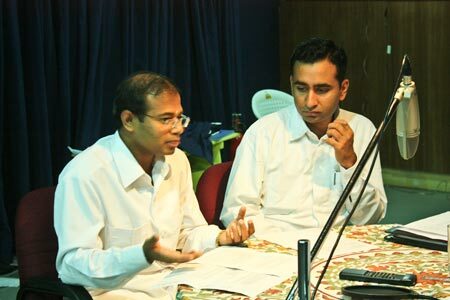 Ganesh (KM) are research scholars at Swami’s college, Bishu Prusty (BP) currently serves at Radio Sai. 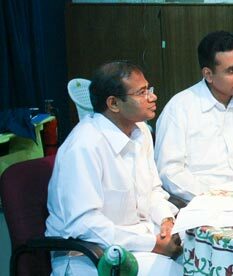 Mr. G. S. Srirangarajan (GSS), a long-time former faculty member at the Sri Sathya Sai Institute of Higher Learning and presently the Controller of Examinations at the same university, is the moderator of the session. GSS: Sai Ram to all of you! In this session, let us start with Bhagawan’s Chinna Katha about a minister and a king. The import of his words dawned on the king a few days later. During one of his solo hunting expeditions in the forest, the king was resting under a tree. Taking him by surprise, the servants of a certain tribal chief seized him, and bound his hand and foot. The king questioned, “Why do you bind me? What do you intend doing with me?” The tribesmen replied, “We are going to sacrifice you at the altar of a Goddess as it is our custom to offer a human sacrifice once a year. The time has arrived and we are fortunate to have found you.” The king remonstrated, “Let me go. I am the king of the realm. You cannot kill me for a sacrifice.” The tribesmen laughed and said, “Is that so? We are glad this year’s sacrifice will be unique and our Goddess is sure to be highly pleased with us for offering in sacrifice a great personage such as you.” So in spite of his protests the king was carried and duly placed on the sacrificial altar. This is a very beautiful story that Bhagawan narrates to demonstrate that whatever happens eventually turns out for good, whether we like it or not and whether we see the meaning in it or not. This is generally referred to as ‘positive attitude’, which in spiritual parlance is nothing but true surrender to the Lord. The other day, a couple of us were deliberating on this and a beautiful structure emerged from our exchange of thoughts on how an individual can move forward on this continuum towards true surrender. It perhaps starts on the gross level of positive attitude. Once this positive attitude builds strongly in an individual, it brings in faith and when faith grows and we start believing that the things which happen to us is for our good, we see many a time the deeper means that God uses to take us towards our goal. In a way, we are able to understand the mysterious hand of God working in these events and that is how - as people say - we see the ‘bigger picture’. And, once we really see this, we develop the quality of acceptance. It is true acceptance that eventually leads a devotee to the path of surrender. BP: So many beautiful lessons! GSS: Yes, and that will be the premise of our discussion today – about how we move up the ladder from positive attitude to faith to deeper understanding of the ways of God and then to seeing the bigger picture. This is followed by moving into a state of acceptance and finally towards unconditional surrender. 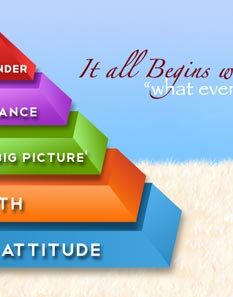 Let us share our views and experiences through each of these stages and aim to understand this beautiful concept. 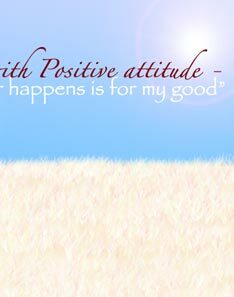 Bishu, shall we start with positive attitude? BP: I can think of no one better to illustrate the concept of positive attitude than Raghu Ram - our colleague at Radio Sai! A few years ago, during his third year of studies at the Brindavan campus of Swami’s University, he met with an accident and became paralysed waist down. He was confined to the hospital bed for two or three years, after which he could only move about on a wheelchair. Soon enough, he desperately yearned to be useful to himself and to the society. He started visiting us in the studio and began working on his thirst for learning and absorbed new skills in the process. He gained considerable proficiency in video editing. Not just that, he has a good deep voice and we use that to good advantage. 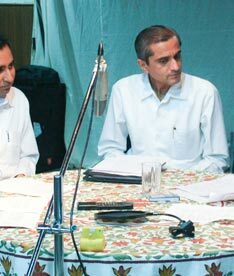 Some of the announcements that are aired on Radio Sai are his voice-overs. Raghu Ram gradually acquired mastery over other softwares such as Adobe Photoshop, Adobe Audition, and Adobe Indesign. Now by Bhagawan’s grace, since the last three years, he is a permanent employee like any of us, working and serving at Radio Sai. And I believe much of the credit for his success stems from his indomitable spirit and attitude to think positive. And Swami has blessed him on several occasions. In fact, on the New Year meet two years ago, Swami created a ring for him. 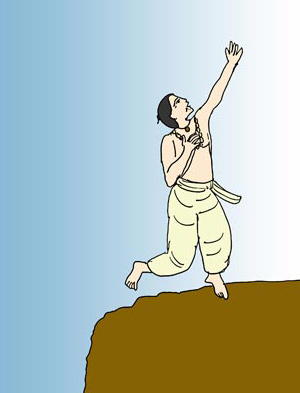 As Raghu Ram could not bend down to take Swami’s padanamaskar, He actually raised His Divine Feet to help him do so. GSS: It’s amazing that despite his limitations, Raghu Ram continues to be so productive. Any other person in his place would have been a complete mental wreck. BP: He is always the one to come first to the office every morning and no matter how much work you give him, it is never enough. He completes it with so much ease. He is truly inspiring and a perfect example to illustrate that positive attitude is actually a personal choice. It not only shapes our lives but also impacts how we actually experience our life! KM: This reminds me of a beautiful anecdote about a Zen master who always had a smile on his face. He would maintain his blissful countenance in any situation – whether tragic or joyous. When he was lying on his death bed, he was surrounded by his disciples who were very sad and obviously grieving. The master, however, was calm, serene and blissful as always. One disciple could not stop himself from asking the secret of his undisturbed, continuous happiness. The master replied with the same eloquence of joy in his voice, ‘Every morning when I wake up, I have a choice of deciding whether to be happy or sad. I simply decide to be happy come what may.’ The answer was simple but profound and tells us how through each moment of our life we have to make a proactive choice to be happy and not live like a reactionary machine. GSS: I completely agree with you. Happiness is a choice that we make with a positive attitude. BP: And, that’s not just a theoretical fact. There are so many people who have put into practice this principle and made happiness their choice. It is not that difficult. AD: In fact, there is one beautiful method that we can all follow and that is through pursuing the ‘attitude of gratitude’. For instance, we can begin the day with counting our blessings and say ‘thank you God for giving me these feet, these hands’ and so on. GSS: Normally, we always focus on what we do not have, forgetting the vast number of things we can be grateful for. SG: It is about seeing the glass half-full rather than half empty. BP: Sometime ago, we had published a beautiful real life story in H2H about a young girl who was fortunate enough to be born into a Sai family and grew up with intense love for Bhagawan. She loved Him to the extent that she believed no one else on the earth deserved to be loved as much as He did. Bhagawan too had mercifully done her aksharabhyasam (in those days during darshan times, Swami would take the slate and write Om. 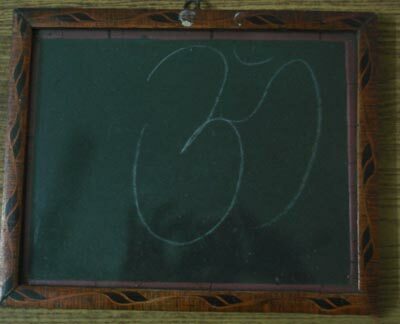 In writing the first word, He would signify the initiation of learning for the child). This happened in 1988. Since that blissful morning, the child’s love for Bhagawan grew in leaps and bounds. When it was time to enrol into college, she desperately wanted to join Swami’s University. The aim became her only mission in life. So, after she finished her 12th Grade, she applied for admission into Swami’s University. She was so focused on her intent that she did not apply to any other university and put herself into preparing for her education at the Anantapur campus. She started waking up early in the morning, wearing a sari and observed all the things a student at the campus would do. She recited her morning and evening prayers, and attended every Sai session. When the call letter finally arrived, she was absolutely ecstatic. GSS: You mean the call letter from the University for admission? BP: Yes, for taking the entrance examination. 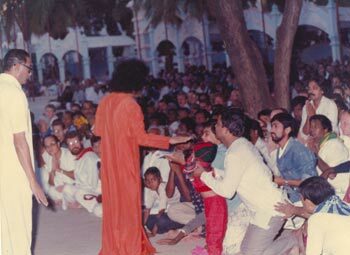 At that time Swami was in Bangalore. The girl came to Puttaparthi with her father and wrote her admission test. She just couldn’t sleep that night waiting for the results. Next morning eagerly she went to the college and searched the entire list but to her dismay her name was missing. You can imagine how devastated she was. Her father tried to console her but that didn’t help much. Both went to Brindavan and had Baba’s darshan where all she could do was cry uncontrollably. She had so many questions for which had no answers. The thought – why did God do this to me? – kept running through her mind. After staying at Brindavan for a day, both father and daughter returned home. As soon as she saw her mother, the girl again broke down. Her mother calmed and consoled her saying Swami had come in her dream the previous night. She saw Him blessing her with a beautiful smile. The mother said that whatever Swami did was for the good and all our joys and sorrows came from the same source, so it is important to accept His decision with a smile as beautiful as Swami’s. The girl’s father tried another strategy. He said that staying in Swami’s college as Swami’s student and following His teachings was no big deal. It was a bigger challenge, he said, to stay outside the campus and continue being a model Sai student. “Try and be a role model for Swami’s teachings. He will love you even more,” her father advised. The young girl took her father’s word as a challenge. She joined an engineering college in Bhubaneswar and eventually became a change agent there. Leading by example, she transformed many of her classmates and brought them on to the right path. Eventually she started her own movement in the college called TOMS (Tomorrow on my Shoulders) to help the underprivileged students. It is important to know that she wasn’t by any means an academically weak student. She was, in fact, the second best in college. After graduation, she was approached by Tata Consultancy Services with a job placement! GSS: That’s a wonderful story. I think it is this sort of attitude that leads to faith. 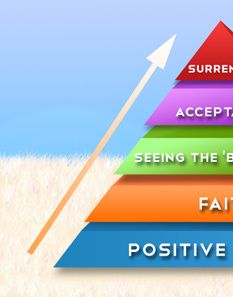 In other words, what we term as faith starts with positive attitude. What do you say Giridhar? SG: History has been witness to the fact that faith can do wonders. 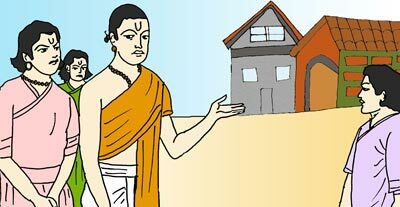 Swami often narrates the story of Kumarila Batta, the Guru of Mandan Mishra whom Adi Shankara had defeated in Mahishmathi. During those days, Buddhism was quite prevalent in India; it was even overpowering in some places. Kumarila Batta who was a Memamsa philosopher wished to understand the secrets of Buddhism. So, in the guise of a Buddhist monk he went to a Buddhist master and learnt the secrets of that religion. But when his treachery was brought to the notice of the master, he was taken to a cliff and dropped from there. Even as he was falling, he implored to God to save him. However, instead of saying, “as the Vedas are eternal, let me be saved”, he said “if the Vedas are eternal, let me be saved”. His words, “if the Vedas are eternal” indicated doubt. So, although he was saved, he lost one eye due to his partial faith. GSS: Giridhar, I have heard Swami telling this story often and He has expressed the same sentiment that it is the word ‘if’ which is the cause of trouble. SG: That one single word made all the difference for the philosopher Kumarila Batta. Absolute faith is what God expects from us devotees. AD: I am reminded of one beautiful story that Bhagawan narrates. It is about this particular Guru who had a lot of disciples. Once, he took all of them to the bank of a river. He was so enamoured by the surroundings that he said, “I wish I had a hut at that particular place which is so picturesque.” In their eagerness to do something for their Guru, the disciples started building a dwelling. and it was very beautifully done. The Guru saw the hut but said he wanted it moved a few feet away. Instantly, all the disciples dismantled it and built another in no time. The Guru once again said the place was not right and asked his followers to rebuild a hut in another place. This went on. Every time, the disciples built a shelter, the Guru would say he was not happy with the place and ask for a change in location. The disciples started getting frustrated and their count started to dwindle. Those who went said something was wrong with the Guru as he did not know what exactly he wanted. Some even said he wasn’t like the one they knew; he wasn’t the same person! GSS: Amey, that story in fact continues and eventually the disciple surrenders to the Guru and asks him why he made him go through all that. It is then that the Guru says, “I was making your mind ready to receive the blessings I am giving you.” Swami often says, “Mano Moolam Idham Jagath” - Mind is the one that comes between the human being and God. And so, it is the mind which has to be tackled. This is the depth of faith a devotee must have in God. All we need to do is just listen and accept what Swami says. After all, we are dealing with the Creator of creation who can make anything happen. This, indeed, is a testimony to true faith. SG : Allow me to share this story with you of a mountaineer who was climbing a hill and suddenly slipped. When he reached the end of his rope, he shouted out to God saying, “God save me!” In reply, God asks him to let go the rope. The mountaineer pleads, “God I am asking You to save me, not kill me!” God repeats, “Just leave the rope!” Instead of letting go the string, the man holds on to it even more tightly. It was freezing cold and the next morning some passers-by found the man frozen to death just three inches above the ground. If only he had left the rope as God had commanded him and not used his own intelligence he would have lived! In the darkness, he could not see that he was so close to the ground for he had trusted himself more than the words of God. GSS: I think that is where the problem comes from. We start analysing the ways of God. Faith is akin to trust without reservation! It need not be belief without proofs. But we should not have reservations. BP: It’s like the need to think with the heart and not the mind! GSS: Yes, that’s right. And, from my own experience and that of so many others, when we do that over a period of time, we do get to see the intricate details that God has made for us. His ways do become apparent. But it takes time. Let’s now move to the next step where we slowly start seeing the deeper ways of God - how exactly He has planned out an event that eventually turns out to our benefit. Amey, do you have any experience in this regard? AD: I would like to share an email forward that I am sure most of us would have read. It is a story about a very devout person who used to pray, “God, give me some work that I want to do for You! 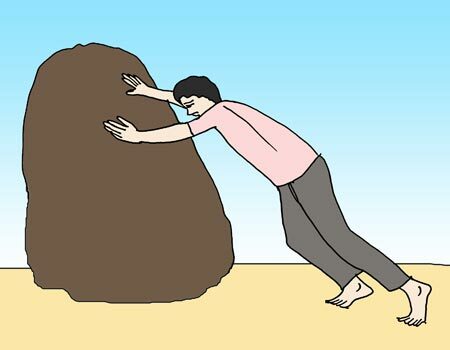 Give me some task.” One night, the Lord appeared and said, “You really want to do something for Me?” The man says, “Yes!” God tells him, “There is a big huge boulder outside, I want you to push it.” Strange as it may sound, he gets ready the next morning, goes out and sees the rock and is convinced he would not be able to move the boulder. Anyway, he gets on to his work. 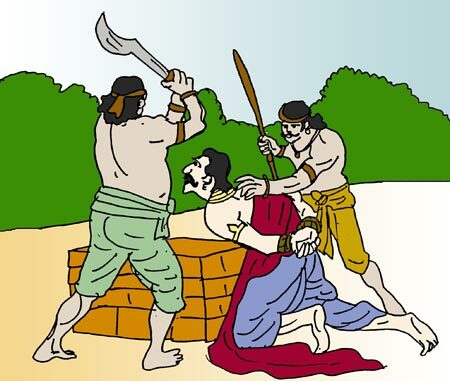 Drawing a parallel from this story, many a times in our life Bhagawan gives us a role to play that makes us wonder why we are being put through that assignment. The answer obviously is the fact that in doing so, He is only preparing us for a completely different purpose. BP: We tend to complain because we fail to see the big picture. GSS: We see only the present, that too only a narrow and limited view of things. AD: When Swami says, “Be in the present”, He wants us to expand our horizon and make our ‘present’ a little wider so that it broadens our perspective. It is up to us to understand the deeper significance of His words. BP: A common analogy or rather story that comes to my mind is that of the footprints on the sand. I think many of us would have heard this story but I believe it is worth repeating because it is about how most often we are unable to see the big picture and complain to God in the bargain. It is about a man walking on the beach when he suddenly sees several scenes from his life flash across the sky. He notices that sometimes there are two sets of footprints and at other times just one. 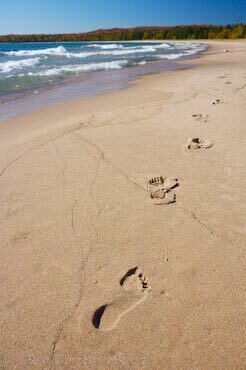 This bothers him and sets him thinking because he observes that the one set of footsteps coincide with those times in his life that were the most difficult. The basic thing as we discussed is faith. All that is required of us is to follow Bhagawan’s word. With faith and over time, we will steadily begin to understand that there indeed is a big picture. KM: Allow me to share with you an anecdote that essentially conveys the same message. A farmer was once lying under a banyan tree for an afternoon nap. 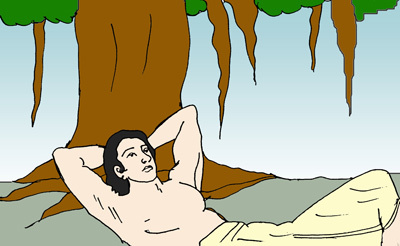 Even as he was admiring the broad exquisite branches of the giant tree, a funny thought crossed his mind as his gaze rested on the banyan fruit. He wondered why God had made such small fruits for that majestic tree. Turning around, he saw huge pumpkins on the ground that had come out of a creeper which was barely able to support them. He felt there was some flaw in God’s design – a huge tree and a small fruit and a tiny creeper and a gigantic fruit. Gradually, he drifted into a sleep only to be awakened by a banyan fruit falling on his head. Then it struck him that had the banyan fruit been as big as the pumpkin, he would not have survived! He realised the infinite wisdom of God in the design of His creation. Dear readers, this was an edited transcript of the radio episode of our series Radio Sai Study Circle. While we definitely enjoyed offering this to you, we would like to know what you feel about this programme. So please do send in your feedback generously to [email protected] Every line you write will help us to know what you want and give us clues to come up with more such ideas and offerings. We hope and pray to Swami that we can serve you better.